Google’s Executive Chairman also quipped, “It’s easier to start a revolution and more difficult to finish it.” Google should know. They’ve been revolutionizing the way in which consumers interact on the Web since their inception and news posted today following the LeWeb chat follows suit. The news reveals a new initiative launching today called the Social Data Hub. What’s even more exciting is the Google Analytics Social Analytics reporting to appear sometime next year. While the details were somewhat vague, I got the inside scoop and what was published should be enough to incite a minor frenzy in the Social Analytics circles. 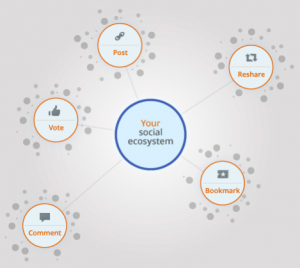 The “Social Data Hub” is a data platform that is based on open standards allowing Google to aggregate public social media posts, comments, tags, and a plethora of other activities using ActivityStream protocol and Pubsubhubbub hooks. (Yea, that’s a real thing…I had to look it up too.) Early partners in the initiative include social platforms such as Digg, Delicious, Reddit, Slashdot, TypePad, Vkontakte, and Gigya among others. Of course Google’s own social platforms, Google+, Blogger, and Google Groups are included as well. Noticeably absent from the list are social media moguls like Facebook, Twitter, and LinkedIn who have yet to buy into the new Googley idea of a Social Data Hub. If you’re scratching your head wondering how this is different than Google just trying to get more of the world’s data, you’re not alone. At first glance this may seem like yet another big enterprise ploy to get more data (and oh yeah, Don’t be evil). Well, I see this as a huge win for marketers, bloggers, publishers and anyone else trying to discern the impact of social media marketing across the multitude of channels and platforms available today. Currently, most marketers are forced to evaluate their social media activities through the lens that the platform (or their social monitoring tool) offers. Typically this yields low-hanging counting metrics which can be of some value, but more often than not end up as isolated bits of information that don’t provide business value. Getting at this all important business value in many cases requires wrangling the metrics into another system, processing data and just generally working hard to gain some incremental insight. This is laborious work for the average marketer, so it’s no wonder that eConsultancy just reported that 41% of marketers surveyed had no idea what their return on investment was for social media spending in 2011. Yikes! So Why Would a Platform buy into the Social Data Hub? Well, it’s questionable if Facebook ever will opt in for this system so I wouldn’t hold your breath on that one. However for other social platforms, being part of the hub has some distinct advantages. They get to prove their value by partnering up with one of the only solutions on the Web that is capable of providing real comparative data on the performance of social channels. This is a no-brainer for fledgling platforms that want to increase their visibility and even for established players, opting into Google Social Hub could mean the difference in gaining advertising dollars from skeptical marketers. While the big dogs in social media may take a while to come around, I see this new Hub as a potentially great equalizer for understanding the impact of social media as it relates to referrals for on-site activities which can ultimately lead to conversions and bottom line impact. Right on! Much of this is actually doable right now through referrer segmentation. It will be very interesting to see how Googles new and upcoming offerings will pump that up! 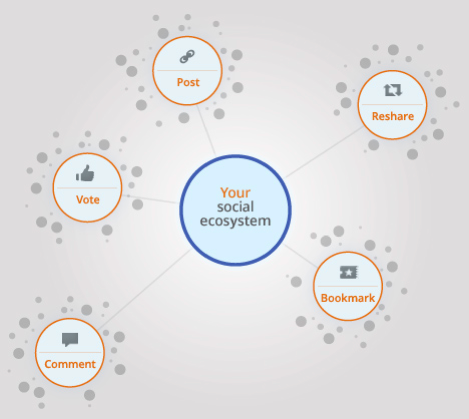 Now, you talk about this social data hub being a potential boon for new and upcoming platforms. I’d be interested in discussing that more as it seems that lately hoarding network data seems to be the decision du jour. Thanks for the great wrap-up. Looking forward to digging in more! This is a great writeup. In fact, I just quoted you 5 times when posting my thoughts on this new development. I absolutely agree that this will be a huge win for marketers and anyone looking to get the complete picture of social media performance. I think it really showcase the value of off-site/on-site data integration. Having one tool that will show me the trend of content distribution, then traffic from that content, and finally revenue from that content, is a very exciting thought. I would love your opinion on PII. I expect this feature to include social media account names, which could very well be PII. This is something that I point out in my post.